Performance by West Australian Symphony Orchestra, Richard Mills from the CD Works by Clive Douglas, Robert Hughes, Brenton Broadstock, Arthur Benjamin, Miriam Hyde, William Lovelock, Dulcie Holland, James Penberthy and Margaret Sutherland. 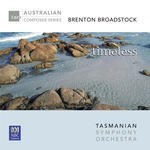 Timeless / Brenton Broadstock ; Tasmanian Symphony Orchestra, Ola Rudner, conductor. Festive overture / Brenton Broadstock. Live on tour / Australian Youth Orchestra, Camerata Australia. Instrumentation: 2 flutes, 2 oboes, 2 clarinets in B flat, 2 bassoons, 4 horns in F, 3 trumpets in B flat, 3 trombones, tuba, timpani, percussion (2 players), strings.